A slice of crispy buttered toast topped with a sweet layer of cinnamon sugar is a simple, but delicious treat. It’s an easy breakfast favorite, although I’ve been known to have a slice after dinner with a cup of tea if I have some good toasting bread on hand and can’t wait for the morning. 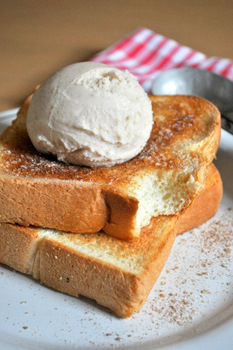 To capture these flavors in a more distinctly dessert form, I turned my toast into Cinnamon Toast Ice Cream. This ice cream perfectly captures the flavor of buttered cinnamon toast (sans bread) in a creamy frozen form. The secret to this ice cream is using browned butter to give it a buttery toast flavor (otherwise it would just be ice cream with cinnamon and vanilla). A small amount of butter is cooked and browned first, then sugar and the other ice cream ingredients are added to it to create the ice cream base. I keep things simply by using ground cinnamon – just like I do on my toast – and vanilla extract in this recipe. The base should be completely chilled before churning. This ice cream is very creamy and rich tasting thanks to the brown butter in the recipe. You will get the best results with this recipe if you churn it in an ice cream maker, no matter which kind you have. The dry ice method works well and is a fun option if you don’t have an ice cream maker. If you’re a fan of cinnamon toast in the mornings, this ice cream will definitely be a hit with you and you’ll find that it’s just as addicting as that classic, simple toast. Place butter in a medium saucepan and cook over medium heat until the butter comes to a boil. After several minutes, the butter will start to brown and take on a nutty smell. Stir the butter as it starts to brown to prevent it from burning and scrape the brown bits off the bottom of the pan. When the butter is a dark golden color, add the sugar and brown sugar to the butter and cook until sugar has just dissolved. Add milk, cream and ground cinnamon. Cook, stirring occasionally to ensure that the sugar is completely dissolved, until mixture comes to a simmer. Remove from heat and stir in vanilla extract. Strain into another container and refrigerate until cold. When chilled, pour into ice cream machine and churn according to the manufacturer’s directions. Pumpkin Ravioli with Salted Caramel Whipped Cream wins 45th Pillsbury Bakeoff! 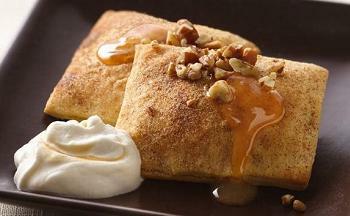 Next PostNext Pumpkin Ravioli with Salted Caramel Whipped Cream wins 45th Pillsbury Bakeoff! The combo of brown butter and ice cream sounds amazing! Great idea! Oooh I’ve made cinnamon ice cream before and loved it, the addition of browned butter is genius!